Here are three of our favorite neighborhood history walks that make for a good break after dinner (or before breakfast). Click on the links below for more information. Pearson Dairy Farm Walk: It’s gone now, but the old Pearson farm defined the landscape of this area in the vicinity of Alameda School just before the turn of the 20th century. This .6 mile walk will trace the outlines of the farm and put you in touch with some landmarks you might not have known existed. 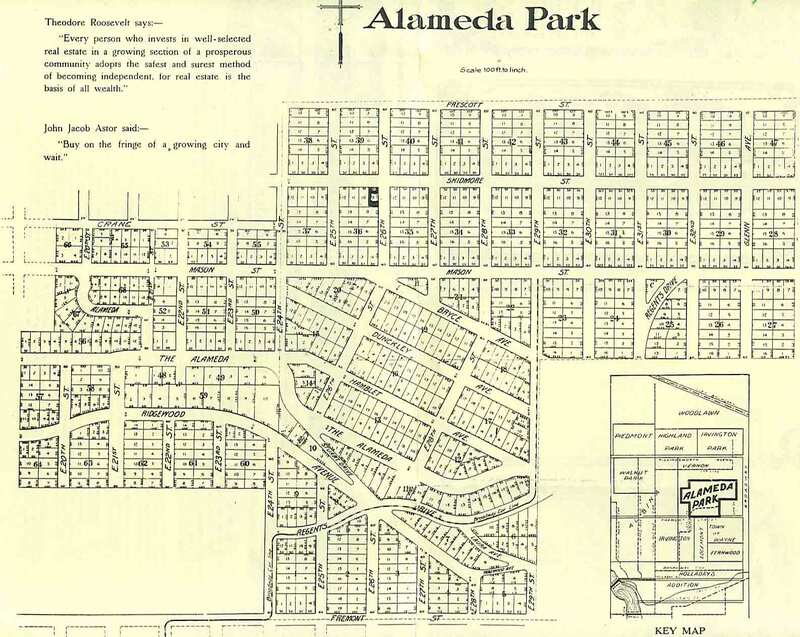 Alameda Park Plat Perimeter Walk: This 2.45 mile walk will take you all the way around the perimeter of the original Alameda Park plat. Bring the plat map along, and pay attention to the interesting alignments on the west edge of the neighborhood, especially around Crane Street (see if you can find the Ghost of Crane Street). Broadway Streetcar Walk: This 3.1 mile loop will have you tracing the path of the Broadway Streetcar that served Alameda for generations. Consider printing the pictures and bringing them along to line up in the footsteps of history.